The most haunting image of old Bunker Hill’s final days depicts a fenced off Victorian mansion awaiting its doom with “progress” looming in the background in the form of the Downtown’s first skyscraper, the Union Bank Building. The residence, affectionately known for years as “the Castle” and located at 325 S. Bunker Hill Avenue, was one of two residences on the Hill to escape the wrecking ball, only to meet an even more tragic end. Located on Lot 16, Block L of the Mott Tract, early owners of the property were tee-totaling Los Angeles pioneer Virginia Davis and her husband John W., who sold the land for $450 to G.D. Witherell in March of 1882. It has long been believed that the Castle was built around this time, but an 1888 Sanborn Fire Insurance Map reveals the structure as being constructed. In 1887 the property changed hands again, so it probably was capitalist Reuben M. Baker who built the large Victorian structure that would be a mainstay on Bunker Hill for over 70 years. Designed in the Queen Anne style, the residence had 20 rooms, both a marble and a tile fireplace, and a three story staircase winding up the center of the house. Two of the mansion’s most recognizable features were the stained-glass front door and an overhang on the north side for carriages to pass through to the rear of the property. The curved Mansard roof on the tower and the triangular crown of a front balcony were removed after sustaining damage in the 1933 Long Beach earthquake. The original address of the home was actually 225 S. Bunker Hill Avenue until an ordinance, passed in December 1889, changed street numbering throughout the City, much to the irritation of many an Angeleno. In March of 1894, grading contractor Daniel F. Donegan purchased the property for $10,500 and moved in with his wife Helen and four children. Though the family lived there for less than ten years, the name Donegan became the one most associated with the house and it has long been believed that the clan were the ones who nicknamed the mansion “the Castle.” A piece of neighborhood lore involved Donegan attempting to clear a nearby rat infested property by offering local children 25 cents for each cat brought to him, to be used as four footed exterminators. Residents were soon irked when their feline pets began to disappear. By 1902, the Donegans had moved, and new owner Colton Russell soon converted the mansion into a boarding house, a role the Castle would play for the next six decades. During its 60-plus year tenure as a multi-unit residence, the Castle would play host to all walks of life of the City of Angeles. Salesmen, doctors, waiters, elevator operators, miners, firemen, tailors, printers, hotel food checkers (well maybe just one of those), and many others called the Castle home at some point in their lives. When the WPA conducted a census of the area in 1939, 325 S. Bunker Hill Avenue was comprised of fifteen separate units, including a small guest house, built in 1927. The landlord’s family resided in four rooms while the rest of the tenants occupied single rooms and shared six toilets. The majority of the occupants were single, white and over 65 years of age. Rent ranged from $10 to $15 a month and occupancy at the Castle was anywhere from six months to eight years. What the 1939 census failed to mention, however, was the Castle’s resident ghost. The spook who haunted the Castle could possibly have been a former resident who met their ultimate doom in the mansion. In 1914 Hazel Harding, a 28 year old former school teacher with a history of mental problems, lit herself on fire and jumped out a second story window. She survived the fall, but succumbed to her burns. In December 1928, 66 year Charles Merrifeld shot himself to death with a revolver in one of the rooms. Merrifeld, who committed suicide to escape the effects of poor health, had been the Castle’s landlord with his wife Bertha since 1919. The Widow Merrifeld would continue to oversee, what she advertised as, the Castle Rooms for an additional eight years following her husband’s death. According to residents interviewed for a 1965 Herald Examiner piece, for years the ghost contented himself with one type of action; “Everytime one of the sculptured wooden decorations falls off the wall, Mr. Spook catches it before it can shatter on the ground and deposits it neatly and safely on the front porch. So the crash doesn’t wake up the tenants.” Perhaps Mr. Merrifeld wasn’t quite ready to give up his duties as landlord. In 1955, the Community Redevelopment Agency (CRA) announced its plans to overhaul Bunker Hill, and by 1968 the only residences of the bygone era that remained were the Castle and the Salt Box, located at 339 S. Bunker Hill. Both structures were set to be demolished on October 1st of that year, but were saved in the eleventh hour when the Recreation and Parks Commission voted to let the homes reside on city owned land at Homer and Ave 43 in Highland Park. Additionally, the Department of Public Works agreed to move the structures to their new home which would become known as Heritage Square. For the Cultural Heritage Commission, the decision came after a six year battle to save the structures. Once moved, the CHC would then face the task of raising enough money to restore the age-worn buildings. 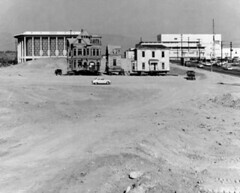 The Castle and Salt Box were relocated to their new home in March 1969 using $33,000 appropriated by the City Council and $10,000 from the CRA. Almost immediately the structures were invaded by vandals. On October 9, 1969 both houses were set on fire. Within minutes, the lone survivors of Bunker Hill’s Victorian era were gone forever. The 300 block of South Bunker Hill Avenue was supposedly one of the most picturesque in the neighborhood, if not the city. We have already taken a look at the mansions located at 315, 325, 333, and 339 South Bunker Hill Avenue. Now we are going to find out a little about the house with the address 321, also known as the Lady McDonald residence. Numerous structures on the 300 block of South Bunker Hill Avenue were constructed in 1888, which may or may not be when the McDonald residence was erected. The Sanborn Fire Insurance map from 1888 (shown below) does not identify the home as “being constructed,” yet it is a mere shadow of the elaborate structure pictured on the 1894 Sanborn map (also pictured below). Please note the existence of a luxurious outhouse on the property in 1888, which by 1894 has been replaced or converted (yuck) into a guest house. Even though neighborhood locals referred to the house for decade as the “Lady McDonald Residence,” the earliest known owner of the property was a fellow named George Ordway, whose wife served on the board of the local Y.W.C.A., and frequently entertained guests at the house. In 1892, Ordway sold the house for $10,000 to the woman who would become the mansion’s namesake. Lady McDonald was born in Canada in 1816, and in those days was known as Frances Mitchell, daughter of a London District Court judge, and niece of noted Canadian, Egerton Ryerson. In 1838, she married the unfortunately named Donald McDonald, who was actively involved in Canadian politics and served many years as a senator. McDonald was also a shrewd investor who amassed a fortune, mainly in real estate, and he, Frances, and their fourteen children lived at the center of Toronto society in a twenty-six room mansion. Mr. McDonald died in 1879, and Frances decided to relocate with a couple of children to Los Angeles. It is unclear if being the wife of a deceased Canadian senator whose assets include a Kansas cattle ranch is qualification for a title of nobility, but when the widow McDonald rolled into town, residents always referred to her as “Lady” with a capital L.
Lady McDonald resided at the mansion with various children, grandchildren, and servants for around twenty years and lived to be nearly 100. Following the departure of the McDonalds, the inevitable happened to house at 321, and it was divided up to accommodate multiple residents. Many tenants would come and go for the next five decades, including Frank J. Giradin, a landscape impressionist who not only lived in the mansion, but used it as his art studio and held a showing of his work at 321 South Bunker Hill in 1924. Unlike many structures on Bunker Hill, which fell into stark disrepair as the years went by, this residence seems to have been well taken care of and was noted as being in “good” condition when a WPA census was taken in 1939. By the 1960s, the condition of the property was of little consequence because the neighborhood’s days were numbered. Before the decade was over, the residences of Bunker Hill were no more, including the former home of Lady Frances McDonald. 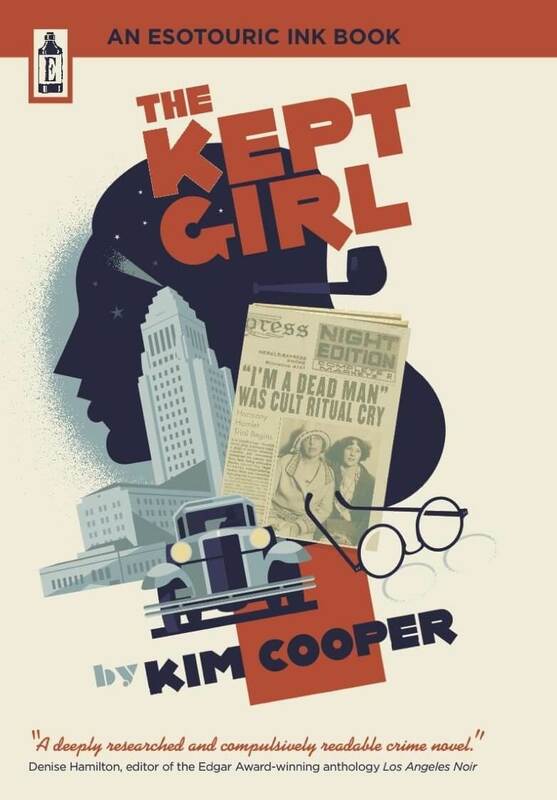 All photos courtesy of the Los Angeles Public Library Photo Collection. Of all the dearly departed Bunker Hill mansions, the Castle and Salt Box are probably the best known. The two houses which resided at 325 & 339 South Bunker Hill Avenue were spared the wrecking ball, declared Historic Cultural Monuments, and posed for numerous photos before being moved to Heritage Square (and were subsequently burned to the ground by vandals). Rarely mentioned is the house that stood between its two more famous neighbors at 333 South Bunker Hill Avenue. As discussed previously, the Castle, Salt Box, and 333 S. Bunker Hill were possibly all built in 1888 by Rueben M. Baker who lived in the Castle and either sold or leased the other two structures. The mansion had various occupants until it was purchased by Spencer Roan Thorpe in 1901. Thorpe was a Kentucky native and descendent of Patrick Henry which gained him easy admission into the Sons of the Revolution and Colonial Wars. He served as a Confederate captain during the Civil War and was wounded three times before being captured by the Yanks and imprisoned on Johnson’s Island. Thorpe survived the War and made his fortune as a lawyer in Louisiana before making his way to Los Angeles in 1883. He purchased plots of land throughout the city, as well as a 150 acre walnut orchard in Ventura County. Thorpe also reportedly started the first settlement in what became the city of Gardena. He also served two terms on the Board of Police Commissioners of Los Angeles. When he moved into 333 South Bunker Hill Avenue, Thorpe was accompanied by his wife, Helena, and their five children. Helena Thorpe hosted many social events at the Bunker Hill home, including a wedding breakfast for her daughter following early morning nuptials at St. Vibiana’s Cathedral in May 1905. Close friends and family would be reunited a mere four months later for Spencer Thorpe’s funeral. 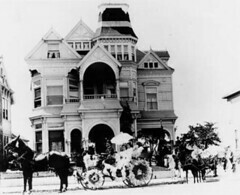 On the morning of September 2, 1905, Thorpe left one of his ranch homes to travel out to Simi Valley and Moorpark. When his horse and carriage returned home alone, search parties were sent out and Thorpe’s body was found on the side of a road. There were no signs of foul play and it was presumed that he died of heart failure. His body was brought back to the Bunker Hill family residence and a small service was held at St. Vibiana’s. The surviving members of the Thorpe family lived in the Bunker Hill house for another year before selling it to an H.N. Green for $20,000 (a little under half a million in today’s dollars). The mansion at 333 South Bunker Hill Avenue survived into the 1960s with little incident. When the time came for the neighborhood to go, the houses on either side of 333 were selected to survive as monuments to a bygone era, and the mansion in the middle was slated for demolition. By 1967, the house at 333 South Bunker Hill was gone. Bunker Hill Avenue was probably the most picturesque street in the neighborhood of the same name. The avenue was much more narrow than the other streets and was lined with some of the most impressive mansions on the Hill. Compared to most of its neighbors, the house that stood at 339 South Bunker Hill was farily modest and came to be affectionately known as the Salt Box. Despite being considerably less grand than the other Victorian beauties on the street, the Salt Box was saved from the wrecking ball and moved to a new location to stand as a tangible monument of the rapidly vanishing community. Unfortunately, the charming structure that stood for eighty years on its original location, only lasted a few months at its new home. The Salt Box was built on Lot 14, Block L of the Mott Tract, which was two doors down from a grand mansion that came to be known as the Castle. The 1888 Sanborn Fire Insurance Maps shows the two buildings as being constructed, as well as the residence between them. Since Rueben M. Baker owned the lots, he was probably responsible for the construction of all three houses. Baker resided at the Castle until 1894 and possibly rented out the Salt Box until selling it to Ada Frances Weyse and her husband Rudolph in 1892. The Weyses also rented out the Salt Box, which appeared to have been converted into a muti-resident boarding house as early as 1891,with rooms constantly being advertised in the classifieds. Joseph L. Murphey and his wife, Augusta, purchased the home in 1902, but it is unclear if they lived in the house or merely took over landlord duties. In 1900, the house at 330 S Bunker Hill was home to two households. By 1910, the Salt Box had been divided up into seven separate units which housed families as well as single tenants. In 1920 there were ten units and by 1939 the house had been further divided into thirteen separate residences. Those who called the Salt Box their home came from all walks of life and included painters, nurses, waiters, and of course pensioners who could afford rents that were as little as $9.75 per month. Compared to the shenanigans taking place at other boarding houses on Bunker Hill, the Salt Box had a rather serene existence. With the exception of resident Annie Prendergast, who was hit by a car at the corner of 4th and Grand and killed, the residents of the Salt Box lived quiet lives, until the Community Redevelopment Agency (CRA) came knocking. By 1968, all of the once proud Victorians of Bunker Hill Avenue had been demolished, except for the Castle and the Salt Box. The two structures that had been constructed at the same time had been spared. Once the CRA began pushing forward with their grand redevelopment plan in the mid-1950s, the writing was on the wall for the mansions in the neighborhood, and in an attempt to save a couple of the structures, the Salt Box was declared Historic Cultural Monument #5 in October in August 1962. Designation was soon bestowed upon the Castle which became HCM #27 in May 1964. The rest of the decade was spent trying to figure out a way to spare the two structures from the wrecking ball. At the end of 1968, the decision was finally reached to move the Castle and Salt Box to Highland Park in an area called Heritage Square. The pair of structures were relocated to their new home in March of 1969 and awaited restoration. These grand plans for the faded beauties were never realized because in October of 1969, vandals torched both houses and eighty years of history were wiped out in a matter of minutes. Photos courtesy of the Los Angeles Public Library Photo Collection. When thirteen year old Lizzie Fryer failed to return to her home on Bunker Hill Avenue for supper, her parents began to fret. As the evening wore on, they became so concerned that they decided to search for her. At first they thought that Lizzie might be in the company of a young man named Zens. Lizzie was a popular girl, tall and well developed for her age, and she had been allowed to go to parties with Zens because he was related by marriage to a good friend of theirs, Mr. Clearwater. Because of the congenial relationship between the two families, the Fryers had always felt comfortable allowing Lizzie to spend much of her free time with the Clearwaters. The Fryers were confident that they’d find Lizzie at the Clearwater home in East Los Angeles. However, upon their arrival they were given some very disturbing news. Mrs. Clearwater said that she had not seen Lizzie – and coincidentally, her husband, father of their several young children, was also missing! Suddenly Lizzie’s mother remembered a strange conversation that she’d had with her daughter just a few days earlier. “What would you do if I left home and never returned?”, Lizzie had asked. Believing that Lizzie was only joking, she hadn’t paid much attention to such fanciful speculation. However, in retrospect she found their conversation alarming, particularly since Clearwater and Lizzie had always seemed to be extremely fond of each other. The frantic parents continued to search for their missing daughter, but things took a turn for the worse when they spoke with local shopkeepers and learned that Lizzie had been seen with Clearwater at about noon. According to witnesses, the couple had been headed toward the Southern Pacific Depot. When the Frys discovered that a northbound train departed after 1 pm, it was enough to convince them that Lizzie and Clearwater were on the run together and headed north. They immediately went to the police station and asked Chief Cooney to send a wire asking that the train be searched when it reached Tulare. The wire was sent, and the train was scoured for the missing couple, but they were nowhere to be found. The distraught Fryer’s swore out a complaint against their former friend. 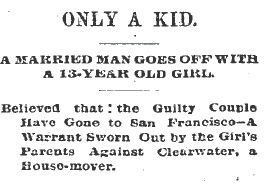 If the runaway girl and her married lover were ever found, it wasn’t reported in the LA Times. It was a week ago when newspaperman W.D. Van Blarcom, Jr., known as Van, helped wife Emily, a Wyoming gal and a gifted china painter, onto the white, ascending Angels’ Flight carriage and made a most distressing speech: "I can’t be good; I want to be bad. I shall be bad. My brothers and sisters have always said that I was the black sheep in the family. Now I will prove to them that I am. Good-bye. Go home and wait for me." She did as she was told and went back to their three-room apartment in the Alta Vista, but there has been no word from Van since and the lady is half mad with worry and regret. When visited by a reporter she was being closely watched by friends who feared she would make good on her threats of suicide. Her story: "My life has become a blank. It is as if I had run against a stone wall. I shall commit suicide. If only he would come back—if only he would let me know why he went—if only I could go to him. And yet they say he has done this thing before. I have reported his disappearance to the police and they can get no trace of him. One minute I believe he has committed suicide and the next I believe there is a woman in the case. Yes—there must be a woman in the case. But in any event, there is nothing left for me. I shall take my life. About a week ago I was arranging some of his clothes in a closet, when a bundle of letters fell on the floor. One of them was from a woman in San Francisco, in which she wrote of a violent attachment for my husband, and added: ‘I suppose you are having a lovely time with you —.’ I am the blank! Think of it! We had a little tiff over this letter and in taking it away from me he tore my arm with his nails, see, here is the sore place yet. Then when I agreed to burn it up and he saw me do so he swore with uplifted hand an oath to his dead mother than nothing but death could separate us. That was just a week ago today. Last Monday he was very despondent and did not come home as promised, and I went down to the newspaper office where he was working and tried to cheer him up. Then I went to Secretary Stevens of the Elks lodge and had him telephone my husband and ask him what was the matter. ‘Everything is all right now; tell her to come over here at once,’ he answered. I went and that is when he took me to the foot of the Angels’ Flight and told me that he wanted to be bad. Finally he sad that he would come home at 3 o’clock in the morning, but he never came." The couple married last Christmas in Salt Lake, three months after Van’s divorce (Emily was four years divorced from a Mr. Miner), and came to Los Angeles via Portland and San Francisco. They choose this town for the climate, which they hoped would aid Van’s lung ailment (he said he’d been shot through the chest while representing the Associated Press in Cuba during the war with Spain). He quickly got work on the Herald, but after ten days moved over to the Examiner, and was so employed at the time of his disappearance. Police doubt he’s killed himself, although friends say he spoke often of doing so, since his last act before vanishing was to pawn Emily’s $50 gold watch. But as he was an Elk, the brothers have taken up a collection to pay the passage of the destitute bride back to her friends in Utah. Where, by the by, he abandoned his last wife in just the same way he did this one. Emily said that Van was related to Lincoln portraitist A.J. Conant and to the wealthy St. Louis Van Blarcoms—a branch with a blackish sheep of its own. 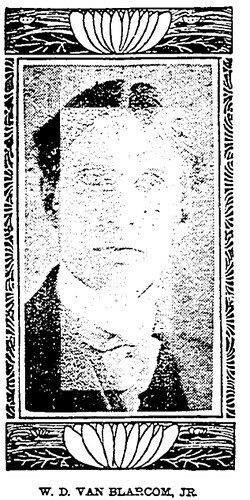 We hear no more of him until 1936, when an obituary appears for an old newspaperman of the right name, approximate age and career history, passing from arthritis in Bakersfield and leaving an unnamed widow, a son and a daughter. Was the widow Emily, or some later wife who was better able to salt this bounder’s wings? *note: Angels’ Flight has its oft-missing possessive in the 1904 article in the Los Angeles Times from which this entry is adapted. In Municipal Court today, Judge Scheinman found George Parent, 32, bookkeeper of this address, guilty of petty theft on the accusation of attorney Stewart P. Fisher. Fisher said he’d given Parent $6 to bet on Gillie in a horse race on February 16, but that the bet was not placed. Parent’s unconvincing defense was that he believed that because Gillie’s stable mate Peradventure had been scratched, Gillie was not open for a bet. After his conviction, Parent asked for probation, and a hearing was set for March 7.